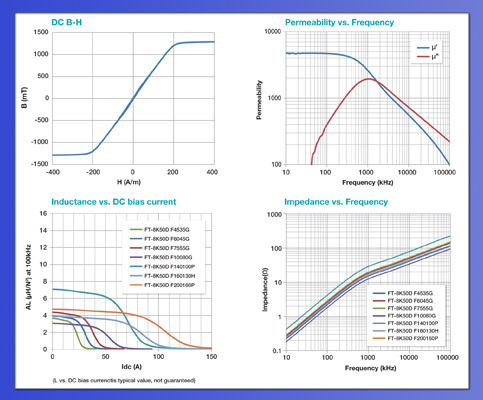 ARLINGTON HEIGHTS, ILLINOIS, USA, Friday, June 20, 2014: Hill Tech Sales, a leader in Components for Electrical Power Conversion today posted information on Extreme nanocrystalline core materials for EMC noise reduction. These materials have come about from advances in casting technique to move from an industry leading 18um thick ribbon to 13um. This reduction in ribbon thickness reduces eddy current losses (most competitors ribbon thicknesses are 20 to 25um) while maintaining high permeability. 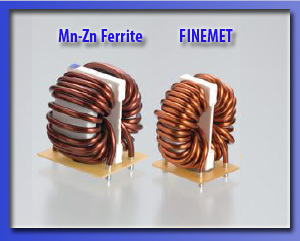 Also optimized is the process of applying magnetic field during annealing. This allows you to use a smaller amount of core volume to provide high suppression performance. 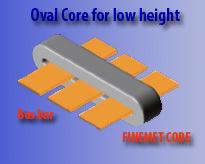 Nanocrystalline cores already exhibit extremely high saturation flux densities, however some applications can still benefit from a higher Bsat. FT-8K50D address this request by further enhancing the saturation flux density by ~ 10% to 1.32T, allowing you to use a smaller core. This entry was posted in post-format-gallery, post-format-gallery and tagged 3 Phase Current Transformers, 600 Volt Voltage Transformers, Auxiliary Current Transformers, Battery Energy Storage, Battery Energy Storage fuse, Capacitor fuse, DC fuse, Ground Fault Sensors (600 V), GS, HH, High-voltage fuses, Low Voltage CT's, Low-voltage fuses, Medium Voltage Current Transformers, Medium Voltage Single Phase Indoor Voltage Transformers, Medium Voltage Switchgear Current Transformers, Medium Voltage Three Phase Indoor Voltage Transformers, Miniature Current Transformers, MV Motor fuse, MV Transformer fuse, NH, Rectangular Current Transformers, Split Core Current Transformers, Switchgear CT's, Ultra-rapid fuses, UR, Wound Primary Current Transformers. Bookmark the permalink.